What? that's crazy talk! chords is chords and notes is notes and if we just have another couple Martinis, it will all sound fine! Well, while it is true that another Martini would be good about now, as far as notes is notes and chords is chords? well, kind of, but actually, not always. Obviously, a "C" is a "C". You may look at a song written for guitar, and think, I know all those chords, I'll just play it as it is written. But, the chords you play for a song written for guitar may not sound right played on the Ukulele. But how could that be? How does one transpose you ask? An easy way is with a transposing wheel. Yeah, sure, you say, as if those are just available for free anywhere. oh, and say "Tiki King Rules!" whenever you are in a crowd. Transposing is also how you can take a song written in a key that is just not right for your vocal range, and change it to suit your voice. So here is how you use this wonderful tool. It is based on what is called the circle of fifths, (see the picture below) because each successive note (going clockwise) is a fifth above the last. So what you do on the transposing disk is on the outer wheel, find the key that the song is in. Then line up the key you wish to transpose to on the inner wheel with that note. So if you're trying to transpose a song in the key of G to the key of C, the outer wheel would have the G at the top, and the inner wheel would have the C at the top just below the G. Now you simply rename all the chords in your song from whatever their root name is on the outer wheel to whatever is lined up with them on the inner wheel. You don't change the rest of the chord name (e.g. the "7", "minor", etc.). In our example, if the song in G uses G, C7 and D7 you'd now play C, F7 and G7 (print it out and try it, you'll see!). 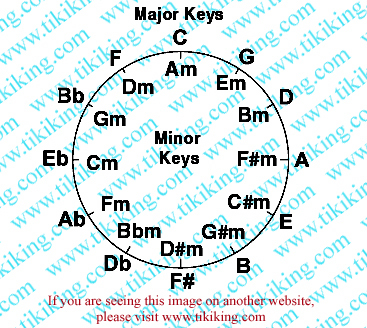 The circle of fifths can be used for many things. To help with chord progressions, to determine the Key that a song is in, to determine the scale for that Key. So, if you pick a key, Say "C" for example, That is your I Chord. The adjacent chord counter-clockwise (left) is the IVchord. The chord clockwise (right) is the V chord. So, in the key of C major, C is the IChord, F is the IVchord, and G is the V chord. Thanks Uke Jackson , and Howlin' Hobbit for all your help! Oh and Hey! If YOU find something here that is wrong, please let me know so I can change it. If you just post on your blog or one of the bulletin boards about how wrong I am, I guess that makes you feel powerful and important and all, but to the rest of us, it's just kinda lame.